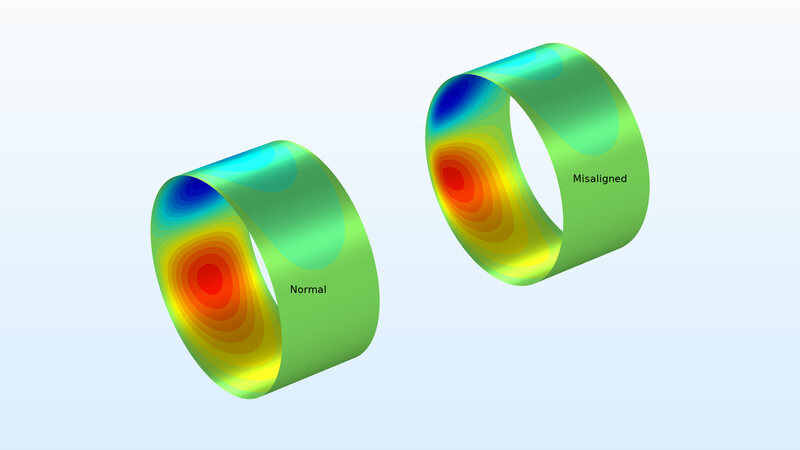 For users of the Rotordynamics Module, COMSOL Multiphysics® version 5.4 includes a floating ring bearing feature, functionality for modeling misalignment in bearings, and a rotor coupling. Read about these rotordynamics features below. 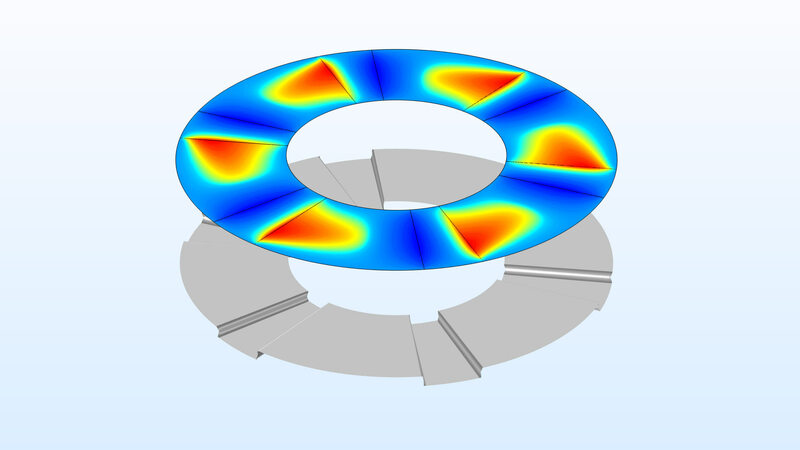 A new floating ring bearing model has been added to the Hydrodynamic Bearing interface. In a floating ring bearing, an extra ring is placed between the bearing and journal surfaces, so that two lubrication films are formed. These films are connected by oil channels in the ring. The ring can be either fully floating or semifloating. 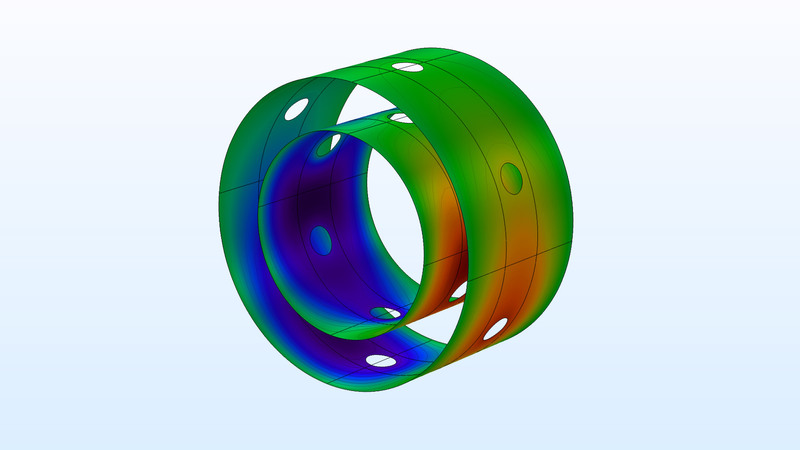 A new tutorial model, Turbocharger Supported on Floating Ring Bearings, is available to demonstrate this functionality. Pressure distribution in the two fluid films in a floating ring bearing. Pressure distribution in the two fluid films in a floating ring bearing. Misalignment in bearings can be a source of vibrations and instability in rotors. You can now include parallel as well as angular misalignment in the formulations for all bearing types in the Solid Rotor, Beam Rotor, and Hydrodynamics Bearing interfaces. 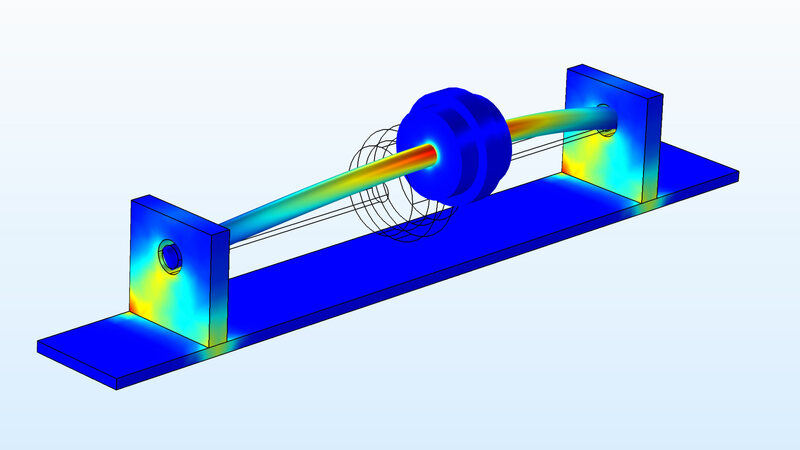 A new tutorial model, Effect of Bearing Misalignment on Rotor Vibration, is available that demonstrates this functionality. Comparison of the pressure distribution in a hydrodynamic bearing with and without misalignment. Comparison of the pressure distribution in a hydrodynamic bearing with and without misalignment. Sometimes, a rotor has more than one shaft, and these shafts are connected so that there is some possibility of relative movement. 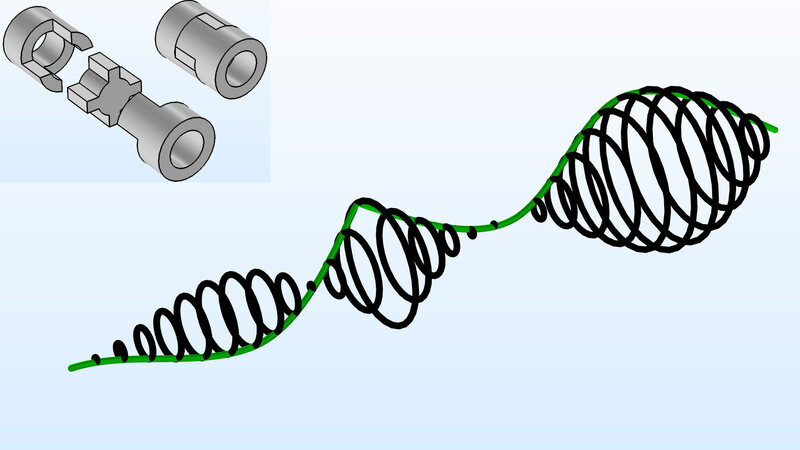 A spline coupling is an example of such a design. 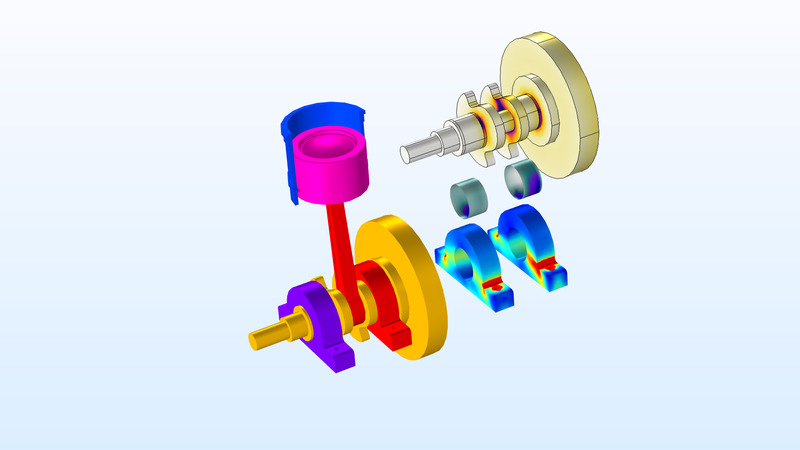 The new Rotor Coupling feature provides possibilities to model several types of such couplings. 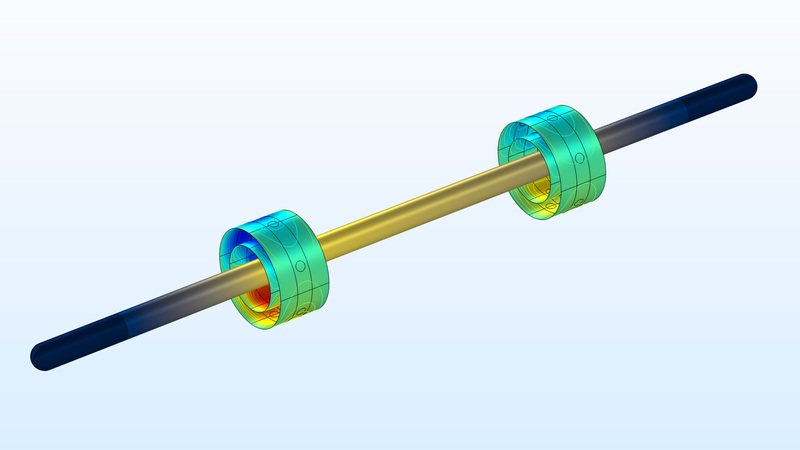 When modeling a rotor coupling, it is also possible to introduce a certain flexibility between two shafts. 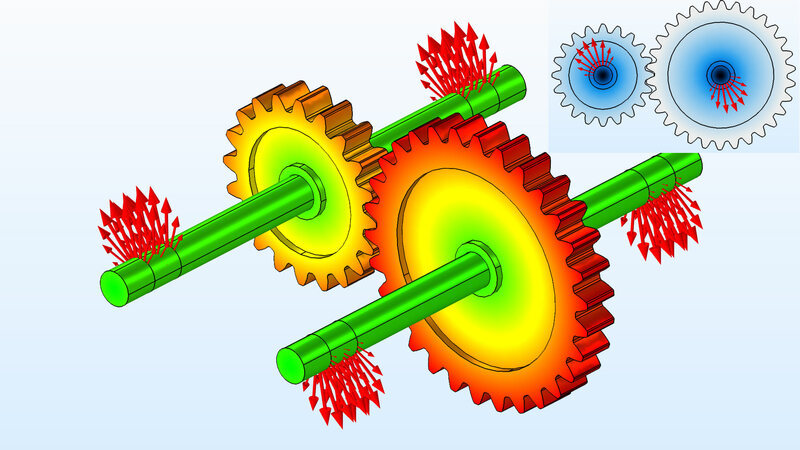 The tutorial model named Rotors Connected by a Spline Coupling is available to demonstrate this new functionality. Whirl mode of the coupled rotors and a schematic of a coupling in the inset. Whirl mode of the coupled rotors and a schematic of a coupling in the inset. Foundation models have been added to the roller bearings, making it possible to model stator-rotor assemblies connected through such bearings. In addition to being fixed, the foundations can either have a prescribed flexibility or be coupled to the movement of another structure. Stress distribution in a rotor-stator system connected through roller bearings. Stress distribution in a rotor-stator system connected through roller bearings. In the Radial Roller Bearing feature, the contact force distribution is computed accurately using contact mechanics to estimate the force transferred by each ball or roller. You can now visualize the roller force distribution in such bearings on the boundaries connected to the inner race. This is available both in the Solid Rotor and Multibody Dynamics interfaces. Displacement of rotors and roller forces at all bearings in a geared rotor assembly. Upper-right: front view. Displacement of rotors and roller forces at all bearings in a geared rotor assembly. Upper-right: front view. Reciprocating engine: assembly, stresses in crankshaft and bearing caps, and oil pressure in bearings. Stress in shaft, together with pressure in both films in the floating ring bearings. Comparison of the shaft orbit during start-up with and without bearing misalignment. 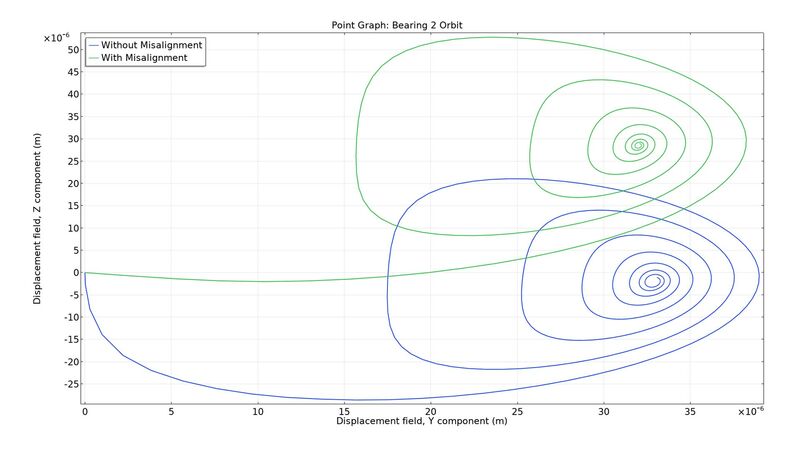 Pad profile and pressure distribution in a step thrust bearing.